This woman really loves life! I am so excited to share with you my interview with the vibrant Betsy Graziani Fasbinder. 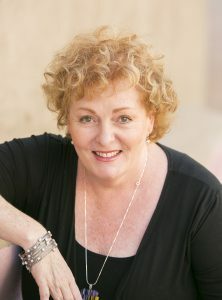 She has released three books with SheWrites Press and shares a little bit about all of them here. I’m certain you will enjoy learning about Betsy and her books! What was/is your latest book release? Tell us about it! My latest book is not a work of fiction, but a resource for writers. 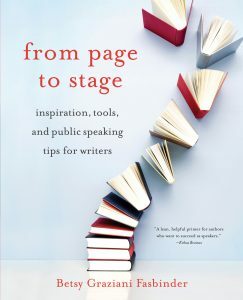 It’s called From Page to Stage: Inspiration, Tools, and Public Speaking Tips for Writers. I wrote it because I was once positively terrified to speak in front of groups. In fact, fear kept me from thinking of publishing my writing for many years, so terrified was I that if I actually published a book, I’d have to stand in front of people to talk about it. That seems absurd now, but it’s true. I eventually got frustrated that I was letting fear of being in front of a group rob me of opportunities, both in my writing and in voicing my ideas, experiences, and viewpoints on matters about which I’m passionate. So, I sought training in public speaking, and I saw that a few simple skills, supportive coaching, and some practice could radically improve my ability to speak in public. I learned to manage my nerves and to speak in front of audiences of any size with confidence and skill in a way I could not have, at first, imagined. I want that for every writer, many of whom are either timid about speaking in public, perhaps as fearful as I was, or simply want to gather some skills to talk about their stories, their writing, and ideas they hold dear. This book is my version of a love gesture to writers and storytellers whose work has meant so much to me. I want every author to feel confident and bold when they’re talking about their writing and their ideas. 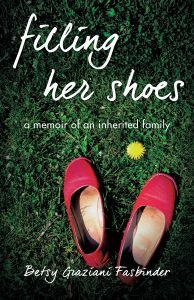 Prior to this book I published a book of fiction, Fire & Water and a memoir, Filling Her Shoes: A Memoir of an Inherited Family. 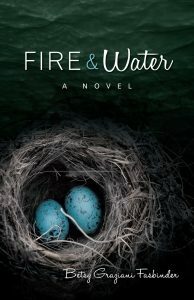 Fire & Water is a dark love story about the link for some people between extreme creativity and madness, and about the painful experience of being in love with someone suffering profound mental illness. I’m about halfway through my first draft of a new book of fiction. I’m happy to be back to fiction, my first love as both reader and writer. It’s fun to be back into the work of an imagined world. This new story keeps knocking on my mind…even coming to me in dreams. That’s when I know it’s a story that I must write. What advice would you give to your younger writing self? So many of my younger self’s fears kept me from pursuing all kinds of things, including publishing books. I was afraid of “living out loud”, telling both my lived and imagined stories, fearful of feeling exposed and conspicuous. What I’ve discovered is that in finding my voice, first on the page and now in my spoken work, that it’s incredibly freeing to rid myself of the burden of hiding. By first publishing, then talking about my writing, I’ve had the priviledge of encounters with readers who tell me that my stories made a difference to them, made them feel more understood or gave them insight into some aspect of human experience. This is the most deeply gratifying part of writing for me. I’d have missed out on all of that, were it not for writing and publishing stories. Have you always wanted to be a writer? What made you decide to become one? I recently recalled something funny regarding that. When I was about eleven, I read an author’s dedication to her mother in the front of the book. I decided at that moment that I’d someday write (though I didn’t imagine publishing, at all). So I took a piece of onion-skin paper, and in my eleven-year-old version of caligraphy I wrote a dedication to my mom of some future, imagined book I’d someday write. I stained the paper with tea to make it look old, burned the edges, and rolled it like a diploma, tying it with a black ribbon. This became my mom’s holiday present. Later, practicality prevailed and I did other work to earn a living, but I always wrote privately. I published my first book at age 54, sadly long after my mother had passed away. So I suppose this desire has been in me for a long time. I always wrote—stories, poems, journals—but only pursued publishing in my more mature years. I think I wanted to become a writer because stories mattered so much to me. They were not just entertainment, they were escape, inspiration, understsanding, and adventure. I wanted, and still want, to be able to provide that to others. Who is your favorite character in your book(s)? It’s funny, I actually miss the characters in my novel, Fire & Water. They feel, even still, that real to me. A supporting character in the story in Fire & Water is Mary K (short for Kowalski). I may miss her the most. She’s a sassy, sometimes foul-mouthed, but an always truthful friend to Kate, the protagonist of the story. She’s fiercely loyal, brave, and also funny. Mary K became a surprising hero in the story—surprising to me, even! She’d be a girlfriend of mine in “real life” when actually, she’s a composite of many close women friends I’ve enjoyed in my life. Where do you do most of your writing? This is where I must confess a luxury. Six years ago, my husband and I moved to a modest mid-century ranch house. It’s a small, not a fancy place, but it does have a little cottage in the back yard, separate from the house. This has become my writing studio. I think of it as a little birdhouse, overlooking a scene of hills and trees in the distance. Honestly, I feel like a millionaire when I’m in that studio and am reminded of Virginia Woolf’s A Room of One’s Own. My earlier books were written in a open landing at the top of the stairs, with family members and pets running through constantly. I have little excuse now not to get writing done–though I manage to find excuses, I’m afraid. Honesty. Honesty in personal life and in writing or any professional pursuit. This seems like a simple word, honesty, but it’s a complex virtue. It’s not simple truth-telling, it’s about being impecible in the pursuit of understanding and telling of truth. It’s about authenticity. It’s about setting aside biases and agendas. It’s about bravery. It’s integrity. A fictional story can be told with “honesty” because it tells a story with authenticity and not simply for commercial gain. It’s not manipulative of the readers nor a contrivance. Memoirs and essays are one kind of truth-writing, but not the only kind. Sometimes the truest stories are told through fiction, though that may seem contradictory to some. I recall as an adolescent reading A Tree Grows in Brooklyn, by Betty Smith. Though a work of fiction, it felt at that time like the “truest” thing I would ever read. I like what the author Pam Houston says, that everything she writes is true, and some of it actually happened. What else would you like your readers to know about you? I’m someone who loves sharing whatever I’ve learned, sometimes what I’ve just learned, with the next person right behind me trying to understand the same thing. This is true for those whom I coach as writers, as speakers, and in my role as a therapist, though of course that’s a different kind of sharing. Now in the final year of my fifties, I’ve finally determined what I want to do when I grow up. Throughout my various careers and roles, I’ve strived to communicate clearly in intimate conversations, public ones, and in my writing. I love helping others to do the same. This feels like my life’s purpose. Tell us a little about your process. Pantser? Plotter? Mixture of both? I do tons of mental plotting of what I write in every genre, sometimes for many months, or even years. I often have a mental image of the beginning, much of the middle, and the probable ending of a story or book, though that can change and evolve as I do the writing. I write reams of notes about my characters, search for photos of people whom I think they might resemble. But I don’t so much plot stories out on paper. Sometimes this causes me some pain because I write many pages—sometimes many chapters—that later get deleted from the final piece. But I’ve tried to plot more formally, and for me, it takes the freshness out of the writing. My way is messier, but it works for me. In my few recreational reading moments, I’m reading Beautiful Illusion by Christie Nelson. It’s a gorgeous bit of historical fiction set in my own San Francisco. Most of my reading time is going toward the manuscripts of writers for whom I’m providing developmental writing coaching. It’s a delight, but not quite the same as simple pleasure reading. If you could spend the day with one of your characters, who would it be and what would you do? Of course, I’d love to spend some real-life time with Mary K, whom I mentioned above. But I would also love to spend time with Jake Bloom, a more primary character in Fire & Water. He’s a brilliant artist and a passionate person. I’m sure he’d be a fascinating person, as long as he is not in his more treacherous cycle of his mental illness. What actor/actress would you like to play the part of your protagonist if your book became a movie/television show? I actually sent a copy of Fire & Water to Maggie Gyllenhaal because I thought she’d be a perfect person to play Dr. Katherine Murphy in Fire & Water. I’m sure she’s inundated with books, so I never got a response, but hey, a writer can try, right? What are your top 3 favorite books? This is tough. Of course, it might be tough to name just 300 favorite books. But okay…three. I have to list John Steinbeck’s East of Eden for its sheer mastery. Pam Houston’s Sight Hound also comes top of mind. It is such a creative way to tell a story and she exposes with raw candor the “truth” that she and her characters uncover. And finally, I must say I Know Why the Caged Bird Sings, by Maya Angelou is among my favorites. This book was so groundbreaking, telling a story both in its ideosycratic detail and its universal truth. This book changed the course of my life in profound ways. Do you have any rituals that you practice before sitting down to write? I have to confess that I’m a bit of a binge writer, so my writing “rituals” change all the time depending on what I’m writing and in what stage. But one practice holds me in good stead, regardless of what I’m writing. At the end of my writing time in a day, particularly when I’m feeling a little stuck about the next part of the story, I write what I call “dream seeds”. Just before bed, I write questions to myself or even addressed to my characters about their choices, behaviors, background, etc. More often than not, my dream seed blossoms and I dream the answer to the question. Sometimes I dream of a plot point. At other times, I uncover a motivation of a character or a bit of their history I’d not yet imagined. I think these come to me in dreams because the distractions of the world are set aside during sleep. Dreams are my main source of untangling the knots in my writing. What do you like to spend time doing when you aren’t writing? Of course, I love books and I love going to author events, and even host a quarterly readers’ series. But beyond that, I am a bit of a movie nut, rarely going a week without going to the movies and now, there’s Netflix—both blessing and curse. And I love spending time with loved ones, sharing meals, playing cards, traveling together. Subscribe below to my newsletter and receive a FREE Girl with a Gun bookmark!